Some days, it is still hard to believe I am a father. Let alone a dad to two children. Then, comes one like today that leaves me both proud and dumbstruck. My son, our first, turned 18. The same day John Lennon was born, in fact. 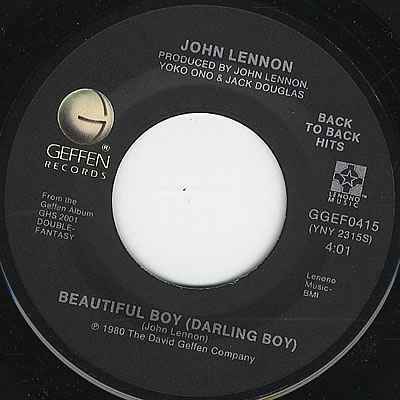 When the ex-Beatle wrote the song, Beautiful Boy (Darling Boy), and released it on the 1980 album Double Fantasy, I couldn’t think it mattered. Yet, it has grown with me the only way this sentimental, poignant tune can, given the circumstances. I look upon it as I did with the small baby boy I once cradled in one arm. Blooms in a manner that breaks your heart as it swells in pride. Lovely sentiment to your boy/man! Thank you very much, Cindy. Great post, Michael. Touching song. Congrats to your boy and congrats to dad as well! Thank you very much, Fernando. damn I can’t even imagine my boys being that old. they are currently 5 and 2 months. There will come a day, my friend. Many thanks. True. I can’t say I miss that chore ;-). Absolutely wrenching tribute, made all the more poignant by Lennon’s untimely passing. I have five kids, ranging from 17 down to 11, three of them sons, and I could not have come up with a more moving tribute. My middle kid Danny is 14, and a huge Beatles fan. A belated Happy Birthday to your son! You are a great father. I don’t know if I’m worthy of your thoughtful, kind words, but I thank you most sincerely, Sam.